Technically the first day of spring is about a week away, so this was the last hike of the winter. My paying gig has kept me busy this week, and the weather really limited how much I got out on the trail, but that’s life. I finished a couple of projects around the house, made some progress on a few more, and prioritized what I want to do over the next few months (not the least of which is work on my trailer to turn it into a really nice dog hauler). One of the projects I finished this week was setting up a pen for Ranger so he can be outside all day. He has a nice insulated house and an elevated bed (my parents got me a Coolaroo for the boys for Christmas). Ranger likes this set up, but doesn’t use the bed as much as I had hoped. I think that will change once it gets over 60 during the day. As soon as finances allow I’m putting in another 10′ x 10′ kennel. I should note that I don’t like that the bottom of Ranger’s pen is all concrete, but that’s what came with the house, so that’s what I have to live with for now. 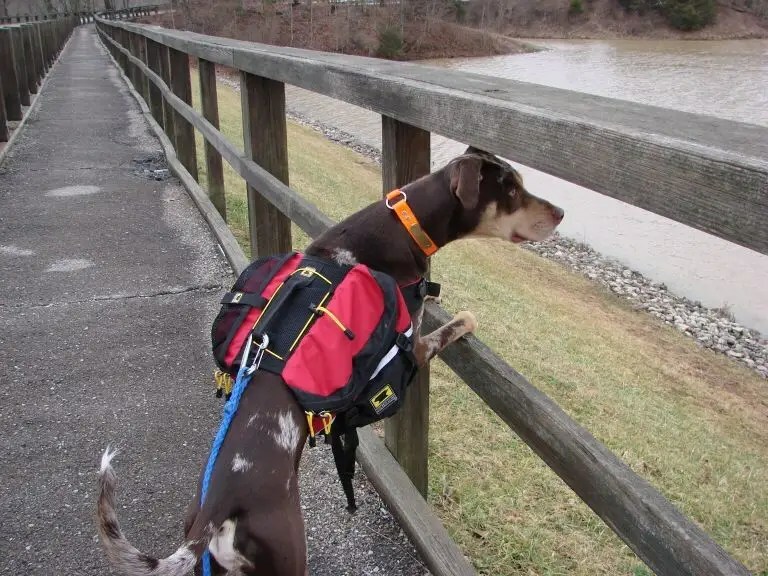 Speaking of Ranger, we got out on the trail (Indiana’s Whitewater Memorial State Park) this afternoon after the rain let up. It was cold and wet, but we both got some much needed exercise. He’s always been a refined dog, especially when compared to Beau, but he’s had trouble putting on weight lately. I changed his food to something with a similar formula, but different protein/fat/carbohydrate ratio. That, combined with increased activity, I think will help him bulk up a bit. 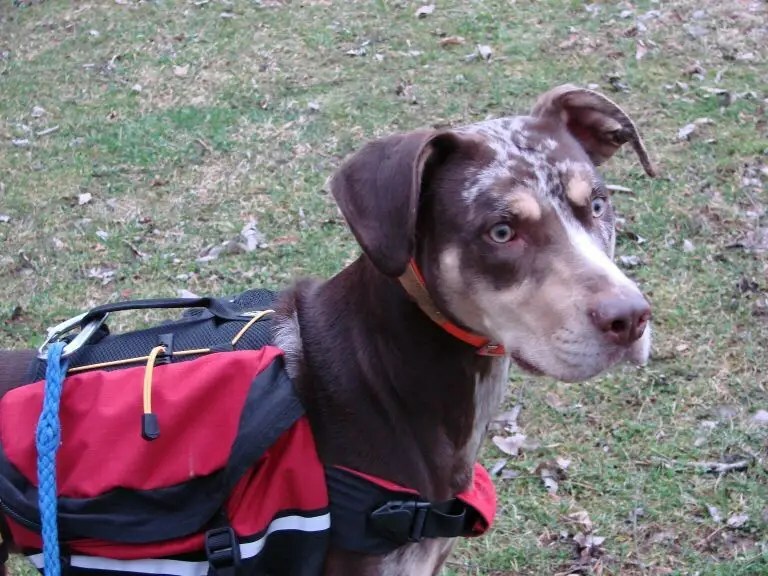 I’ll post more about the little guy learning the ropes as a trail dog in the upcoming weeks. I don’t much care for the pack I picked up for him last year. I got it used for really cheap, but this is a size small and he is still able to climb out through the chest if he tries. He’s not yet big enough for his Ruff Wear pack, but only barely. I may end up using it soon anyway just because I don’t think he can get out of that Y-harness. And showed the key to a happy life: take everything in stride! I caught up on every episode of The Skeptic’s Guide to the Universe (it took me the better part of a year), and most of my other science & skepticism shows, so I’m trying out a few new (or, at least new to me) podcasts in my rotation. Playing now is The Dirtbag Diaries. It’s well-produced and the content is, in my opinion, inspiring, and encouraging for folks who want to get outdoors. It reminds me a lot of “This American Life”. Good advice from the episode I’m on: “Get some sh-t done. Don’t make excuses.” I feel as if I’ve been making many excuses (not enough time, not enough money, too tired, too cold, too wet, blah blah blah) lately, and I need to stop. Goal for the rest of 2010: hike or bike 400 miles. 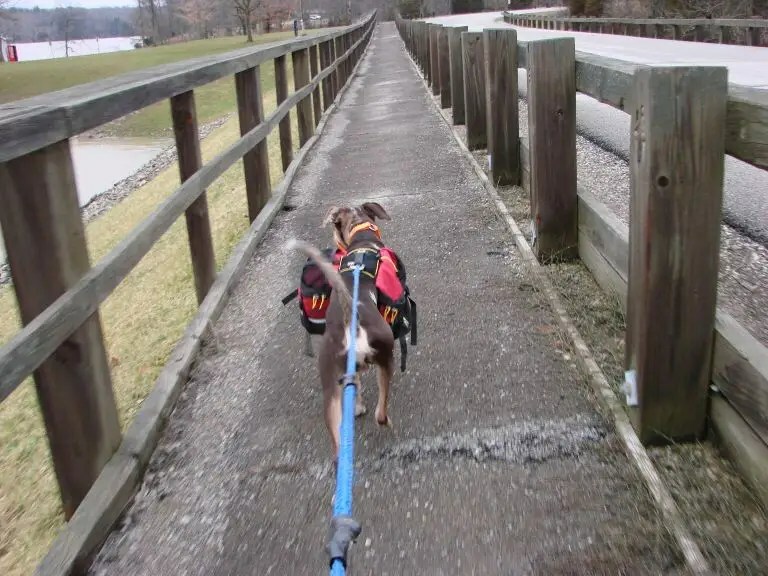 Including the 2.5 miles with Ranger today, that’s 397.5 miles to go. Sadly, two of my favorite feeds have gone dark, or will in the coming days. J.C. Hutchins is no longer producing audio content, although he is still writing. He’s still around on the web, but his podfeed will not be updated any time in the foreseeable future (though I have to say again, I will buy/read his stuff if/when it gets into print &/or other formats). The Seanachai is having a live wake on Monday, March 15, 2010 Wednesday, March 24, 2010. Patrick E. McLean will still be producing content for the interwebs and in print, so I don’t despair . The Seanachai is another of those shows that feels like a good friend, or at least that coworker that you like to eat lunch with. I’ve listened to both feeds for some time, and they’re what got me hooked on the format in the first place back when I had the broken leg and couldn’t get around well (also, it was easier to listen to things than it was to sit up and read while I was getting my electrodes-on-the-leg physical therapy). I found out what my REI dividend is going to be today, and I already have that earmarked, primarily for stuff that will make my road trips much easier. Mice chewed up some wiring in my Jeep this winter, so that’s the priority for my bank account this week. I’m hoping it’s a simple fix—and by “simple” I mean “cheap”. If it does I’ll get to go on another trip south in the upcoming weeks.